This ProCharger fuel pump is designed so that you just have to plug the hoses into your existing fuel system leaving the stock intank to run at a lower pressure and feed the external pump. The fuel pump assembly contains a high flow, high pressure fuel pump. It is installed in-line between the stock in-tank pump and the fuel filter (outside of the tank), and is used to increase the fuel delivery capacity of the stock fuel system. Used in conjunction with your stock pump, fuel pressures in excess of 100 psi can be attained. The pump by itself is rated at 24O lph at 42 psi. 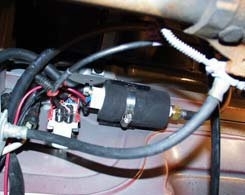 The fuel pump is wired into your stock pump harness and operates only when the in-tank pump operates. Since the internal drive motor is a dc type motor, the pump output is dependent on proper voltage (13.5 vdc) and requires correct orientation of the positive and negative power leads (as specified near the power terminals of the pump) in order to flow in the correct direction.